Biggest Seattle news on the second day of free agency was a tweet saying Seahawks are talking about trading Earl Thomas for a first- and a third-round pick. On the second day of NFL free agency, when TE Austin Seferian-Jenkins passed on interest from his hometown Seahawks to sign with Jacksonville, when WR Jordy Nelson signed with Oakland, and when DT Sheldon Richardson was being courted by Minnesota, the most intriguing Seattle news came via tweet about the future of Earl Thomas. Obviously at this time of the NFL year, discussions are as ubiquitous as poodles in Beverly Hills. But since general manager John Schneider two weeks ago at the scouting combine said there were “no untouchables” on the Seattle roster, and in December, Thomas went out of his post-game way to find Cowboys coach Jason Garrett and tell him, “come get me,” it is open season on rumors surrounding Thomas. The last healthy man standing from the Legion of Boom and Seattle’s second-best player, Thomas won’t be 29 until May and enters his contract year wanting to be the game’s highest-paid safety. After six Pro Bowls in his eight seasons, there’s a lot to like and and it’s all expensive. The Seahawks apparently are ready to let someone else sort it out. The problem isn’t talent. It’s whether the acquirer has the ability, desire and resources to satisfy team and Thomas. The Seattle price is steep; a report Wednesday said the Cowboys passed on the demand for their first-round pick, one behind Seattle at 18. If Schneider sticks to the reported demand for a first and a third, he could walk away empty-handed. If it’s true that Thomas wants to top the best-paid player, the Chiefs’ Eric Berry ($13 million) for multiple years, that cuts the candidate list considerably. Nevertheless, there a lot of coin being thrown in the field of 525 free agents. Landing Thomas and extending him before his free agency in 2019 could upgrade any defense to playoff-readiness. The Seahawks already made a priority out of re-signing a potential replacement, Bradley McDougald, before free agency began, giving him $13.9 million over three years for a six-year veteran who will be 28 in November. He started twice for Thomas when he sat out with a a sore hamstring, and then the final seven games at strong safety when Kam Chancellor went down with a neck injury. The Seahawks have no second- or third-round picks in the April draft. So if Schneider gets his asking price, the flong-term future will look brighter. As for the near-term of 2018, potentially without Thomas, Chancellor, Richard Sherman, Michael Bennett and Cliff Avril . . . not so much. The Hawks should put Joey Galloway’s jersey on Earl and offer him to the Cowboys. Two first rounders easy! But Dallas needs WR’s more. If Earl is moved it’ll be to an AFC team. They’re already going to face Sherman, Bennett, Graham and Shead next season. Why add to that list? Too bad Mike Ditka still isn’t coaching in the NFL. Seahawks could use a victim. The “flong-term uture” doesn’t look so momising at the proment. Sherman has to be right. All. The. Time. That’s why he was hard to live with. Lock Sherman in a room with Trump. Wait…what’s in the sky…it’s a bird…it’s a plane…it’s…a trial balloon…with a “For Sale” sign! Funny, it’s just hovering there so beautifully and even with all the rave green and blue lights on it, nobody wants to buy it. Wait until you see the new paint job and hood ornament. 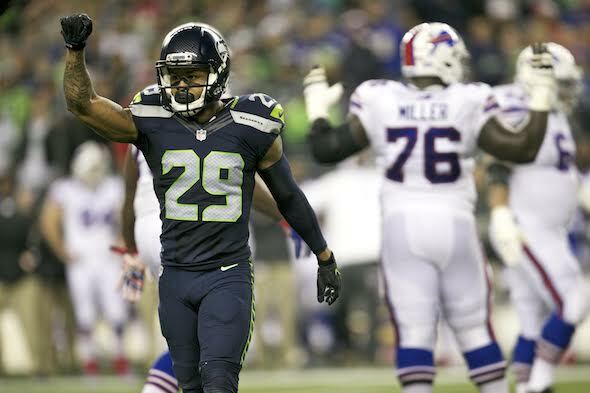 I am a huge fan of Earl Thomas and will HATE to see him leave but …. a #1 and #3 for someone who may not resign with the team after 2018 …. I’d pull the trigger on that deal if someone meets the asking price. Even if they’re in the NFC. And even if it’s San Francisco. Okay, maybe NOT San Francisco; don’t want to have to face him AND Sherman at the same time. I am fine with a 1 & 3 for a player who is very close to the back 9 of his career. I mean, they pretty much drafted a whole secondary with their 3rd-4th round picks last year…you usually don’t draft longterm depth players on day 2. Schneider is on his knees praying the ’17 draftees can play. I agree entirely. It would be sad to see him go but better for something than next year for nothing or 2-3 years later as a cap cut after a bad contract.